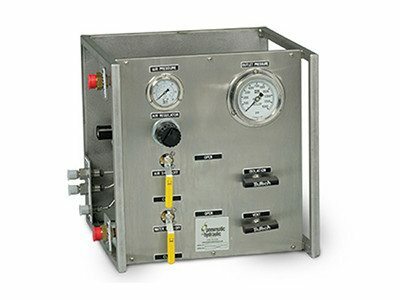 Gas Booster Systems allow you to pressurize gas from standard supply bottles to pressure up to 35,000 psi. These systems can be plumbed for inert gas or several hazardous gases in single or multiple booster units, in single or multiple stage arrangements. They include all air controls, air pilot control switches, relief device and pressure isolation and vent valves. All components are mounted and plumbed in an open, stainless steel frame with a sloped front control panel. Our gas booster systems are available in a number of configurations such as single or two-stage styles, depending on the gas pressure and flow requirements. 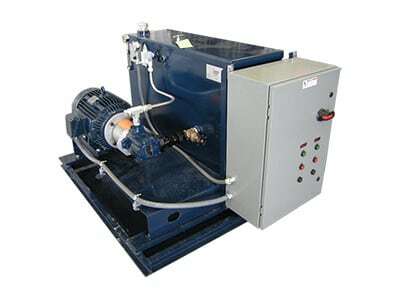 One, two or three gas boosters can be used in parallel or series to meet your exact needs. Any gas booster system has the ability to be remote controlled and/or automated. Pressure transducers and chart recorders can also be incorporated into the design to record your test data. Safety relief devices are standard on all of our gas booster systems to ensure maximum safety for all personnel while operating our gas booster systems. Accessories such as remote pilot switches and gas receivers are available to meet you specifications. Casters can also be added for portability if desired.